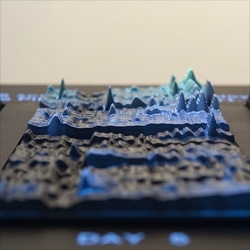 Emoto captured and visualised the global response to the London 2012 Olympic Games on Twitter in an interactive online visualisation and physical data sculpture using pprox. 12.5 million Twitter messages aggregated in real-time. The visualisation ran live in parallel to the Games in July and August 2012 at the WE PLAY closing exhibition of the Cultural Olympiad in the Northwest. Find out more at the Emoto blog.